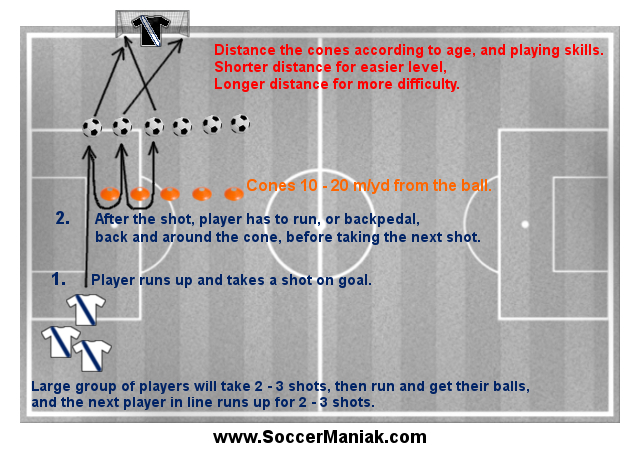 Soccer drills for shooting and finishing needs to be done in game like pace and encouraging players to look for an opening to shoot on goal whenever in a position close to goal (penalty box area). 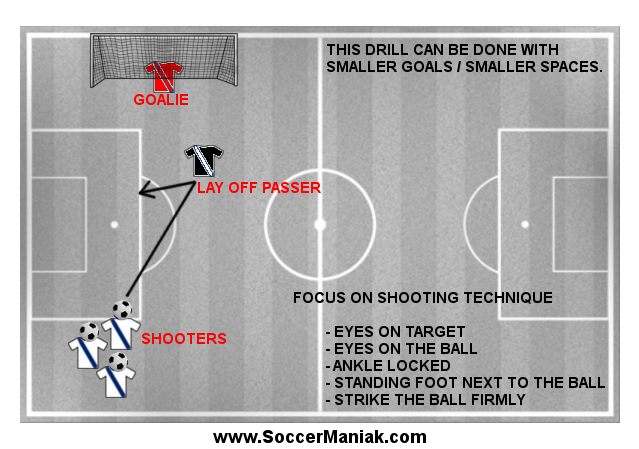 This is a fun soccer drill and can be adapted to many training variations for practicing different skills in the game. 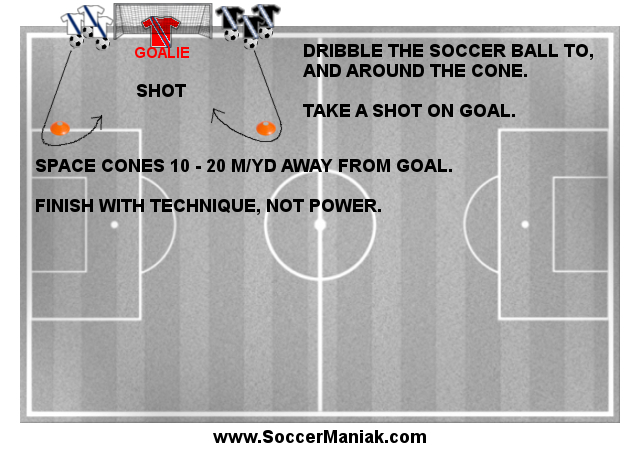 Create a grid 30 m/yd x 30 m/yd, with a soccer goal, or cones used to make the goal. Split players into 4 attackers, 3 defenders, and a goalkeeper in goal. 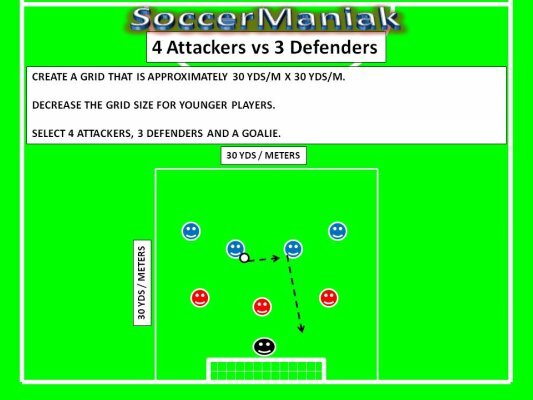 Attackers will use this soccer drill to learn how to exploit the defense when the defenders are in numerical disadvantage. Defending players will use this soccer drill to learn how to communicate, and work with each other to close down space on the field. Attackers will start this soccer drill by bringing the ball inside the box from the opposite side. Attackers will pass the ball around, attempting to find empty space to exploit, and score a goal. Attacking players will have one extra player, so the best way for them to break down the opponent is by passing the ball, and moving around the field. Defenders will try to close down space on the field by working together in covering angles, and more importantly not allowing any passes to split the defense. If players struggle with taking shots and finding openings to score a goal, simply add another attacker, or take out one defender to allow more attacking chances to score. Play with numbers of players inside the grid to see what works best. Limit touches for attackers to 1 - 5 touches. Require 5 - 10 passes, before shooting on goal. Add 2 small goals on the opposite side. Allow defenders to attack these goals if they win possession. Make field bigger, or smaller, depending on age and skill level. Switch the point of attack, and play quickly by moving the ball with 1 or 2 touches. Any opening for a shot should be taken. Defensive line will try to contain the play, and keep the ball in front of them, while applying early pressure on the attackers, not allowing time to think, or find empty space.